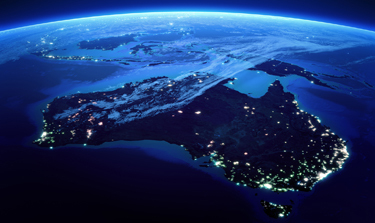 The following information covers Australia's recent population trends and movements. § The preliminary estimated resident population (ERP) of Australia at 30 September 2016 was 24,220,200 people. This is an increase of 348,700 people since 30 September 2015, and 91,300 people since 30 June 2016. § The preliminary estimate of natural increase for the year ended 30 September 2016 (155,500 people) was 5.1%, or 7,500 people higher than the natural increase recorded for the year ended 30 September 2015 (148,000 people). § The preliminary estimate of net overseas migration (NOM) for the year ended 30 September 2016 (193,200 people) was 8.9%, or 15,800 people higher than the net overseas migration recorded for the year ended 30 September 2015 (177,400 people). § Australia's population grew by 1.5% during the year ended 30 September 2016. § Natural increase and NOM contributed 44.6% and 55.4% respectively to total population growth for the year ended 30 September 2016. § All states and territories recorded positive population growth in the year ended 30 September 2016. § Victoria recorded the highest growth rate of all states and territories at 2.1%. The Northern Territory recorded the lowest growth rate at 0.3%.